I don’t know what I would do without my food processor. It makes breadcrumbs and pastes for me; it also chops up nuts and dried fruits. I sometimes even let it chop or slice up veggies for soups and stews for me! Depends on my mood. With the blender attachment I make some amazing smoothies! My favorite and easiest smoothie to make is Strawberry and Banana! However I adore this Mango Smoothie when I have left over mangoes, which rarely happens! A food processor makes life in the kitchen a lot easier! 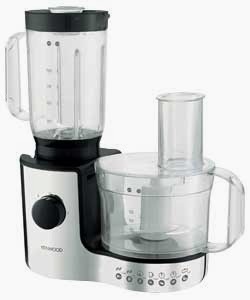 So, how would you like to own your very own food processor? 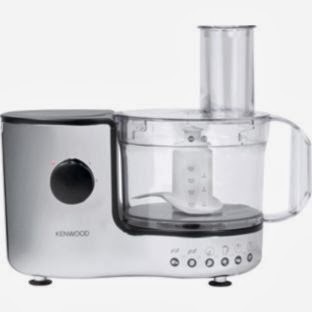 I’m asking because one lucky reader could win a Kenwood FP196 FoodProcessor!! Follow the instructions in the Rafflecopter below for a few different ways to enter! Giveaway starts today and ends on 6th of December! It's open to United Kingdom residents only so please only enter if you have a valid United Kingdom address! notes: This give away is in association with Argos, please see my contact/policy tab for further information. butternut squash and tomato soup! I would make a strawberry, blackberry and raspberry smoothie. I have never made soup and would love to - so that would be my first task! I'd make a celebratory chocolate cake! It's so flexible- chopping, mixing, pastry etc, etc, etc - that it's essential. My Kenwood chef is 12 years old now, and is used at least twice a week - and coming up to Christmas, it'll be working overtime. Pastry for my christmas pies! A nice turkey and vegetable soup. pastry for my mince pies ! dough to bake some lovely warm crusty rolls to smother in butter! It would be an Indian Meat Dansak. With lots of grandchildren who all like chocolate cake for their birthday it would have to be chocolate cake! I would make some vegetable soup. I'd use it to make breadcrumbs for chicken escalopes and crumble mix for an apple crumble! It would be a present for my Mum to compel her to use it for her famous fruitcake recipe! Smoothies. Use frozen bananas and strawberries. Add pineapple juice. Fantastic. I think I would make some home made soup first, perfect for this time of year. Carrot and coriander soup - we love it but it's such a fad to make it by hand as I do at the moment....! I'd ask my brother to make soup from my mum's recipe. As it is so healthy, filling and satisfying for the winter. I'd make some shortbread - yum! I'd make my favourite Potato and Coconut soup ! It's winter so it's got to be a thick vegetable soup. Carrot and lentil soup. Great for winter and for vegetarians! Spicy soup to keep winter at bay. Coleslaw! I've never made it because of all the grating and shredding involved. A food processor would take away the 'argh!' factor. The weather says it has to be soup. Soup of some description....not sure what, depends what I have in. I'd use it for blending soup. I've only got a stick blender at the moment, it gets messy! I would make milkshakes and smoothies for my family. I love banana milkshake and I'll make mango for my mum and dad. The rest of my family tend to like chocolate milkshakes, especially Snickers. Definitely cake - a perfect Victoria sponge I think.